Wednesday 22 June 1994: Awoke in a Phoenix hotel room; the TV forecast a high of 105, which explains why the hotel was empty - most sensible tourists visit in the cooler days of Autumn and the Spring. After a non-too interesting walk around the airport area (lots of dust and litter), we were driven by the Cruise America representative via a rather long and complicated journey to the suburb of Mesa, to collect our vehicle - a small camperhome-type RV with the living area fixed to the back of a pick-up truck. Full instructions were given, then we hit the road, stocked up with provisions ($100), left the city limits and drove north along AZ 88 into the Superstition Mountains, home of many and varied legends about lost mines and lost miners. 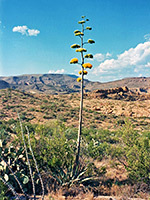 Here we saw our first saguaro cacti, and other exotic desert plants. There were several small lakes along the route which were pleasant enough, but full of noisy children and jetskiers - too close to the city. The 25 mile road, known as the 'Apache Trail', gradually became more scenic, with less traffic, but also deteriorated in quality, with many sharp bends and narrow stretches. Still, it provided a good test of the RV's suspension. The accommodation part of the vehicle was secured to the pick-up truck only by 4 chains at each corner, and it tended to bounce alarmingly after only moderate bumps on the road. 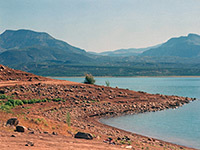 The trail culminated at the impressive Roosevelt Dam, which was undergoing some kind of reconstruction; a little north on AZ 188 there was a good (free) campsite, near Theodore Roosevelt Lake, where we stayed the night. There was a full moon and stars overhead, with no other lights nearby - very relaxing.